This is easy with the correct tool. You'll need a tile ripper. This is a specially designed tool which slides under the tile. You hook it over the retaining nail and either pull down sharply or use a hammer. This will pull out or snap the retaining nail. With the nail ripped out the old tile should slide out. With the old tile out the new one will simply slide in but you need a mean of securing it. Several method are available. 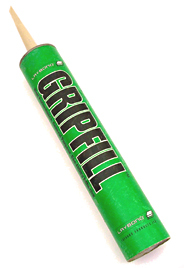 For a quick temporary fix you could simply glue the new one on place with some high performance instant grab adhesive like Gripfill. Make sure that under the tiles are clean and dry. And use a weatherproof waterproof adhesive. 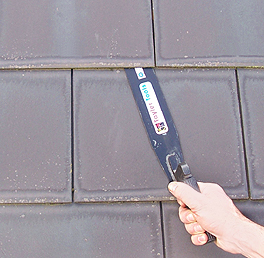 Make yourself a "tingle" from a piece of sheet lead or aluminium, or any non rusting metal that is easy to bend. Cut a long strip approx. 25mm. wide and drill a small hole in it. This is nailed in the gap between the underlying tiles onto the wooden roof batten. 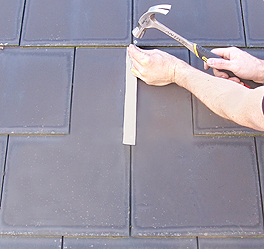 (you should be able to estimate where the batten is underneath the roofing membrane by looking at the position of the tiles and comparing where the nail hole is on the new tile). Make sure you use a galvanised (non rusting) nail. With the "tingle" nailed in place slide the new tile in place on top of it. You need to plan the length of it so that a small amount is left sticking out. Finally bend the sticking out bit over the tile to form a hook which stops the tile slipping down. 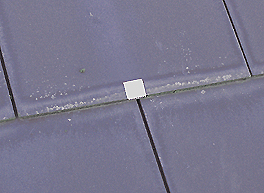 A tingle made from thin metal sheet with a hole in for nailing. Bend the end over as shown when the tile is in place to secure the tile.